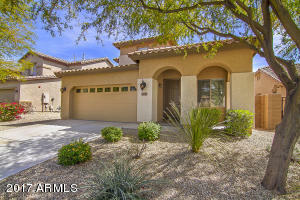 This home is situated in the beautiful subdivision of sonoran mountain ranch, nestled amongst the mountains this well appointed home offers an intelligent floorplan with a home office or den situated downstairs that could easily be converted to a fourth bedroom. The kitchen offers upgraded cabinets and granite counters. During the winter settle down and enjoy the open fireplace in the main living area. The backyard is neatly designed and laid out for your enjoyment. Easy access south to the loop 101 and east to the i-17 makes this the ideal location for your commute or to restaurants and shops. Directions: Start From 67th ave & lone tree trl. From there, go North on 67th ave. Right on lone tree trl, immediate left on 71st ave, then right on eagle ridge ln, property is on the right hand side of the street.